Tubey Toys Review: Video and Toy Review: LOL Surprise Bows, Gudetama, Hello Kitty, JoJo Siwa Perfect Easter Gifts! Bulls-i-toy sent us an awesome collection of blind bags and surprise eggs that would make perfect gifts for Easter! For fans of LOL Surprise dolls, they will be able to wear their favorite dolls in their with these cute LOL Surprise bows by Bulls-i-toy! With double the surprises inside, it’s encouraged to share a bow with your friend! We got lucky and got a duplicate set, so now both pigtails can share the same style bow! Or mix and match the bows to share all of your favorite dolls on your crown all at all once. The bows are full of fun graphics, brightly colored, and securely attached to a metal clip for easy styling. There are 24 bows to collect in and only $4.99 each! Gift basket idea: open the bags and clip the bows to an Easter basket or close up a gift bag with them to add some style. Squish’ums Poo Pets series takes your favorite Squish’ums Squishies and combines the comedy of the poop emoji along with cute animals and magical pets like unicorns, cows, skunks, and more! Don’t forget to take a whiff of these adorable and super-slow rise squishies as they smell like chocolate, seriously, they really do smell like my favorite treat! Take your Poo Pets with you to school, to work, to your friend’s house with the nifty hang tag that clips to zippers. Squeeze and sniff on the go. We got the alligator, Jade, and the pig, Oinkers - Marcello was so excited as pigs are his absolute favorite! Collect all 16 for $4.99. 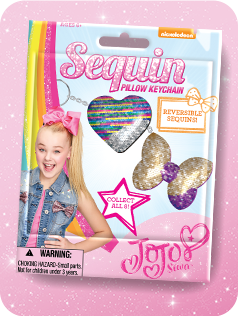 JoJo Siwa’s personality shines, and so do these brightly colored, sequined pillow keychains that are also reversible with the swipe of your hand like magic! Collect fun and sweet shapes like hearts, unicorns, stars, bows, and more. The sequins are so sparkly in the sun. 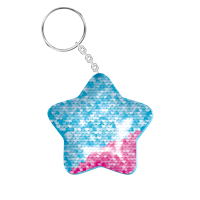 Attach them to your house keys or to a zipper, and shine bright like JoJo! Collect them all for $5.99 each. My new favorite surprises are Cutie Beans are mini plush stuffed with beans. They are packaged in adorable eggs that have a tag to attach to your purse or backpack. We were sent Gudetama the lazy, grump egg, and Hello Kitty and friends! Gudetama is so cute and comes in a variety of styles like kitty Gudetama, Gudetama eating toast, unicorn Gudetama and more. 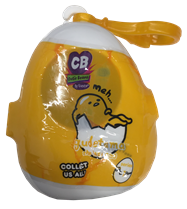 Gudetama’s eggs are white and have an appropriate saying on it, “meh,” which made me laugh! Your favorite, cute friends from San Rio also got some love from Bulls-i-toy! 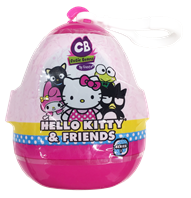 Hello Kitty and her friends are hiding in these brightly colored eggs, and inside you may find one of nine Hello Kitty and friends. 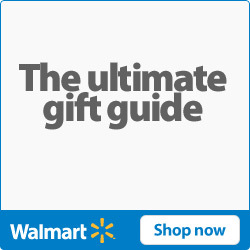 You may find Maru, Keroppi, or Hello Kitty herself! Cutie Beans eggs are $5.99 each, and they are so worth it, and so adorable! I have no problem buying these for all of the kids in my life for Easter. Big thank you to Bulls-i-toy for sending us this amazing package! Let me know your favorites in the comments below.